Tonight we had a few friends over to watch soccer (wait, wait, lest you think you've wandered onto someone else's blog - my interest was mainly in the dinner part of the evening - D's the one who was interestedly watching soccer!) so I thought perhaps a simple vegetarian menu would be perfect for this summer evening. Plus, if everyone's eyes are going to be on the TV, best to make something that doesn't take much concentration to eat - no knives involved! 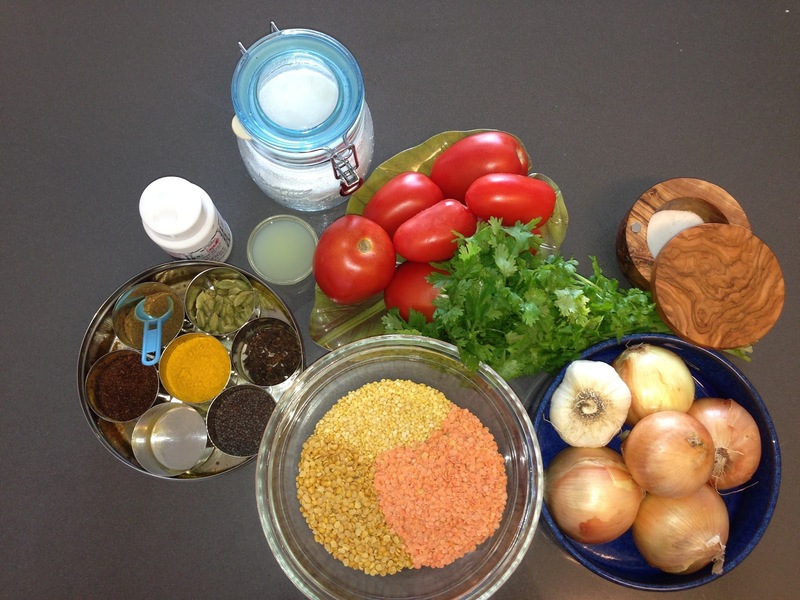 When I first thought of making dal I tried to crowd-source for recipes, texting my group of aunts and cousins for a good recipe. After some hearty chuckles at me not knowing how to make dal (the simplest of all possible things they say!) their recipes started pouring in. And while they all sounded delicious, I thought - why not go to the main source herself?! I'll save the recipes my aunts and cousins sent in for another day - for today, it was darling grandma Aji's mixed dal amti. I'm giving a list of ingredients here, but there's one that you won't find in your pantry but that my grandma always has in heaping quantities. That key ingredient is always a healthy dose of love for anyone eating at her table, and it's something I've found essential to everything I make. It's indefinable, but I'm convinced it's real - even if you have all the right ingredients and proportions, it'll come out all wrong without that extra TLC. Wash and boil all the dals together, and stir until they are evenly mixed. In Marathi there is a very particular word that is really apt for this - "ekjiv"- essentially meaning that all of the dals should become "as one." Doesn't carry quite the same impact in English, but then, translation is like that! Heat the oil on high until the surface shimmers (before it starts smoking - if it starts smoking, it is too hot). Add the garlic, asafoetida, and mustard seeds and let them all splutter together. Then add the onions, stir so they are covered completely in oil and spices, and saute on medium-low heat until almost caramelized. 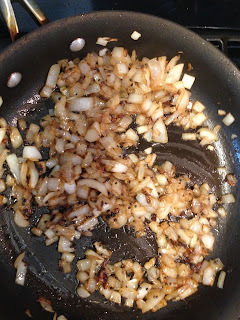 Don't try to rush the process by turning the heat up - this needs to be a low & slow process for the right flavor profile, and you might just end up with burnt onions if you try to rush it. 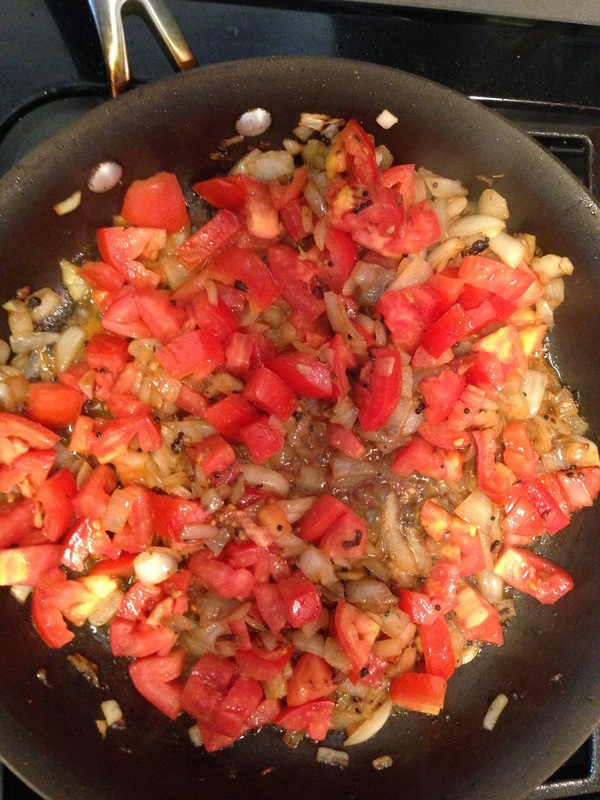 When the onions are starting to caramelize, stir in the tomatoes, simmer. Stir in the boiled mixed dals, then add the turmeric, chili powder, salt, sugar, lemon juice, and stir until everything is evenly mixed. Bring to a boil, then add in coconut milk (if using), stir, and again bring to a boil. The consistency should be liquidy so you can eat it with rice, so add some water (a little at a time) if necessary. At the very end, add in the clotted cream (you can use ghee, I just had some on hand from last weekend's tea party) and simmer for 5 minutes to add an extra touch of richness. 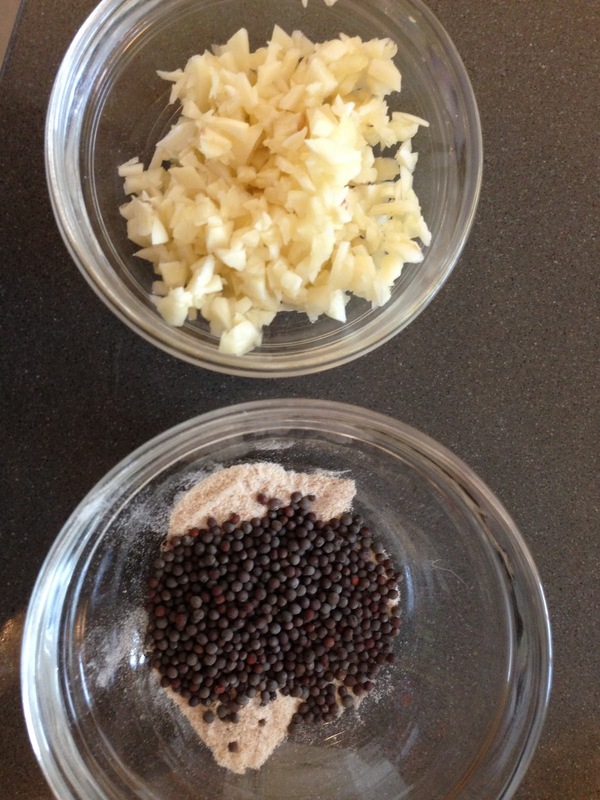 Ideally, serve over rice cooked with cumin seeds. 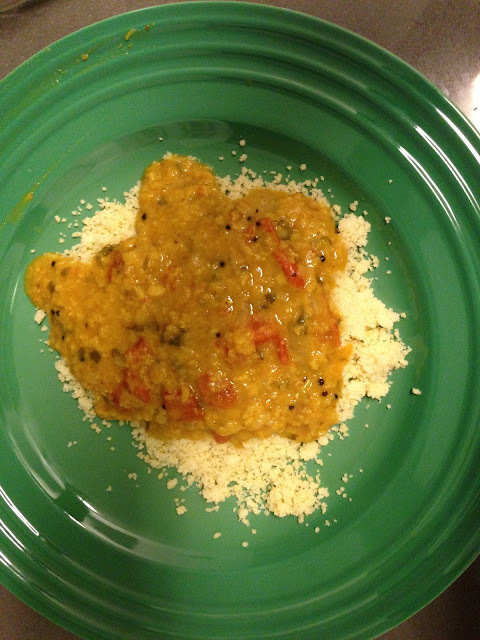 Unfortunately we ran out of rice so we made do with couscous, which oddly enough, made the whole thing taste a bit like South Indian Sambhar! Perhaps because the couscous kind of had a texture like well soaked idli? Not bad, but I'm definitely making some rice to go with the leftovers tomorrow! Dying to try this! Please post more vegetarian Indian recipes. Let me know if you do make this and how it turns out :-) I'm planning some veggie recipes for next week so stay tuned!